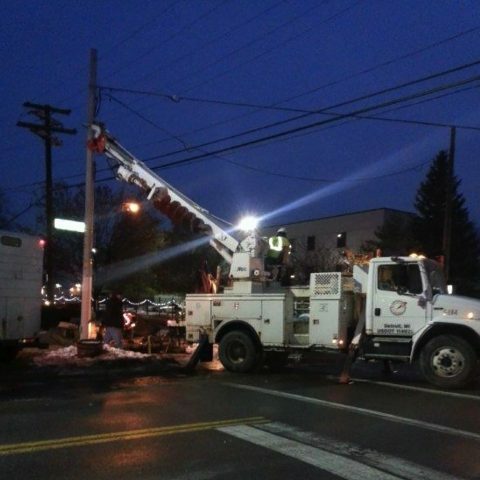 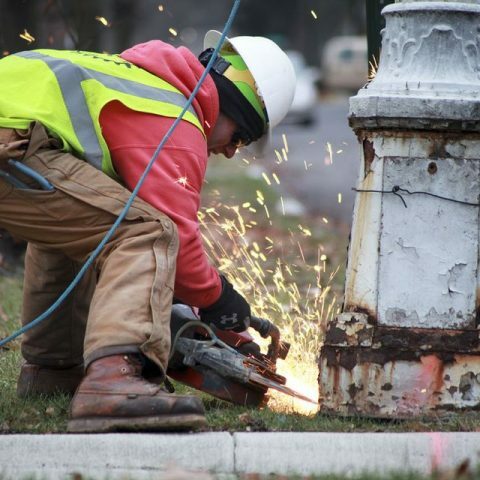 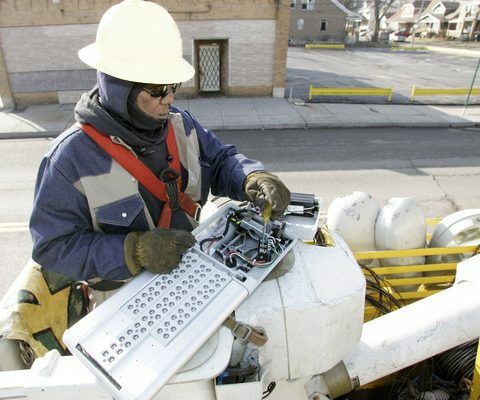 Detroit Street Lighting Upgrade | Motor City Electric Co. 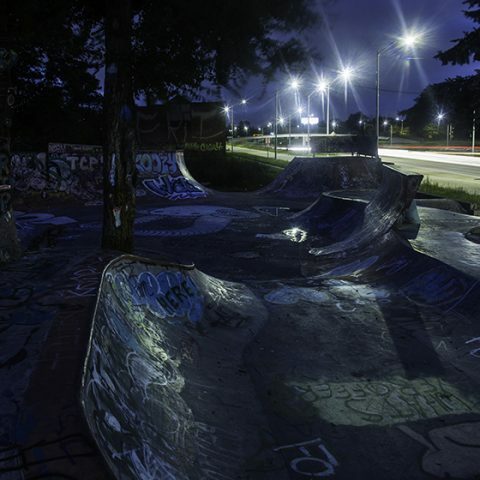 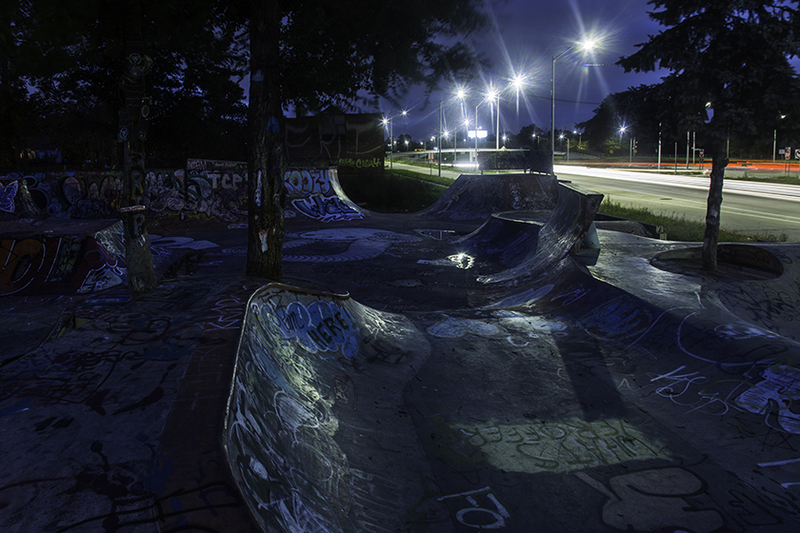 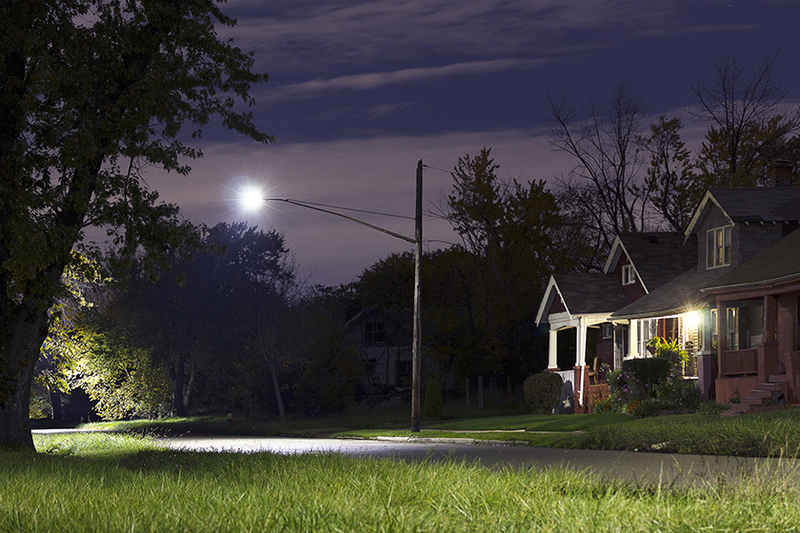 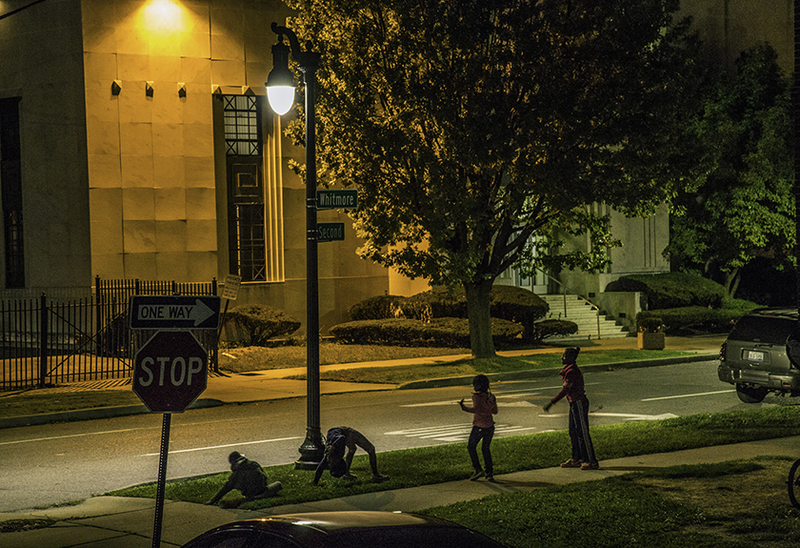 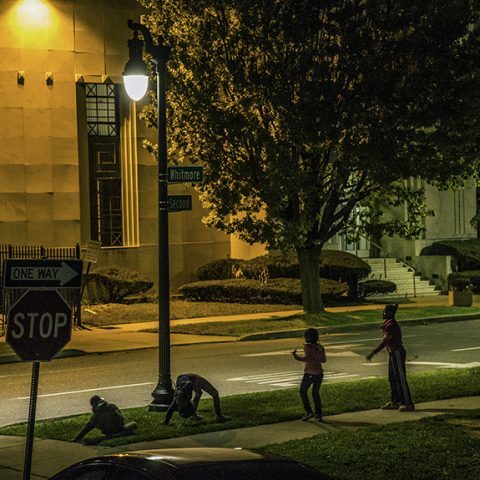 In 2013, it was clear that the street lighting system in the City of Detroit was broken. 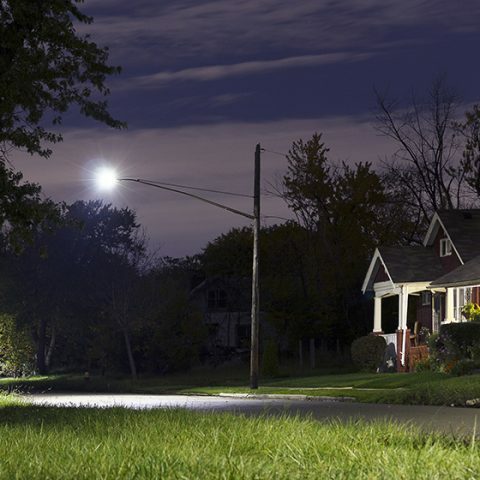 More than 40% of the city’s 88,000 street lights were no longer functioning. 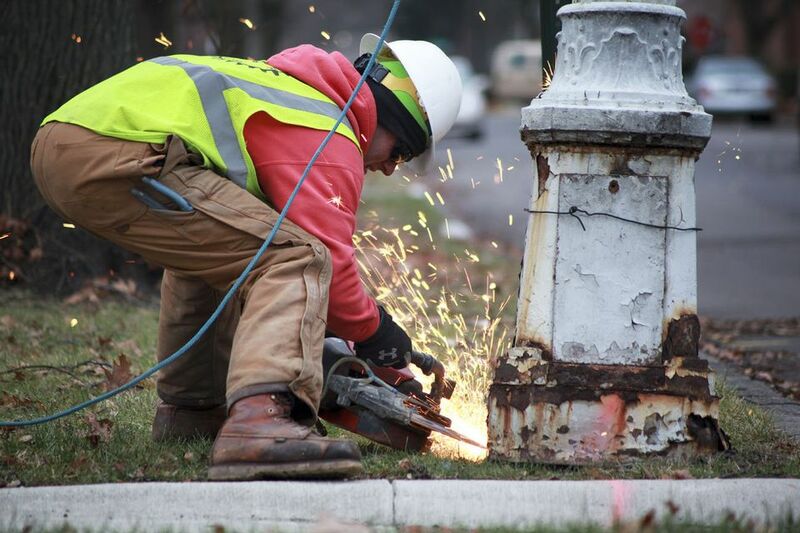 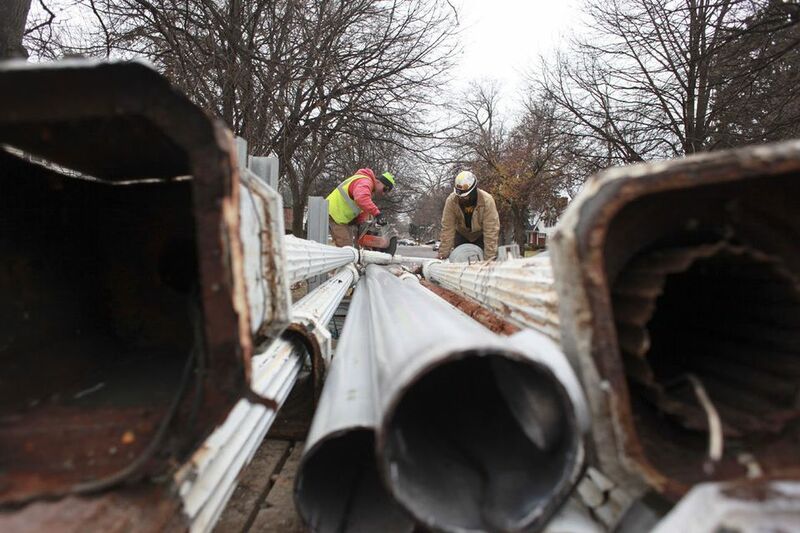 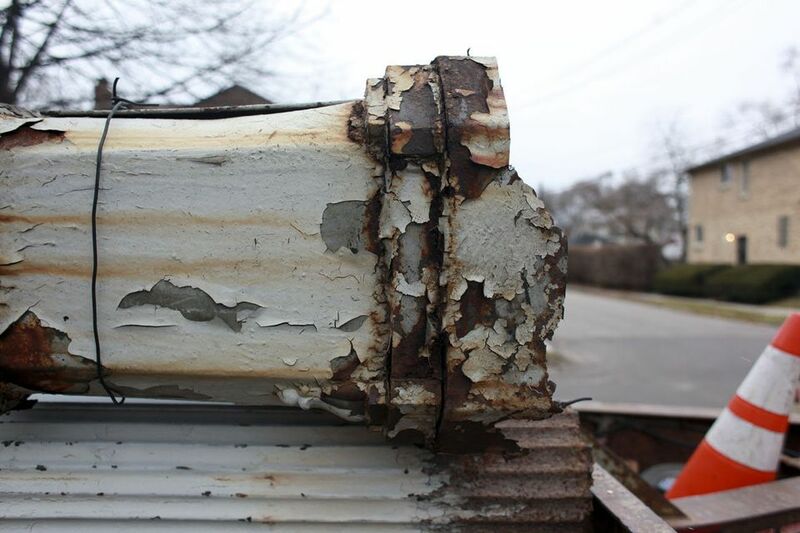 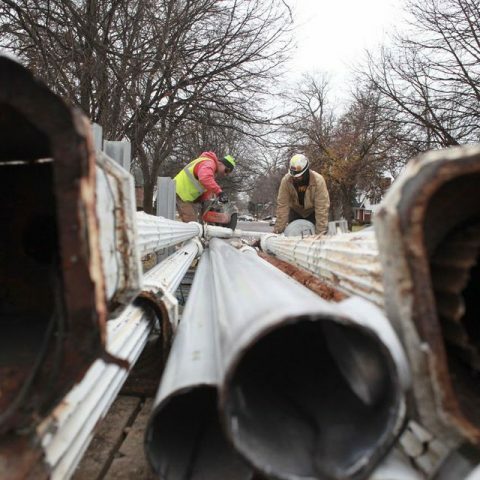 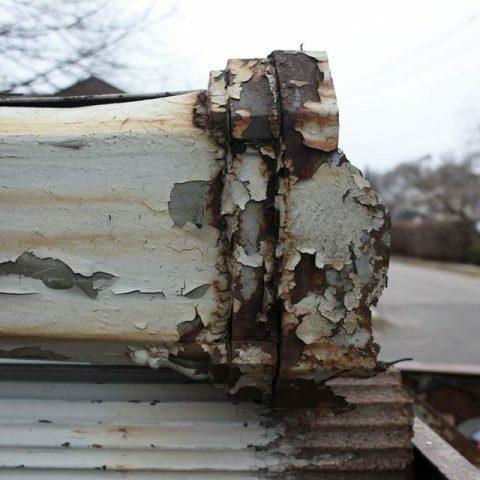 Between budget issues and vandalism by metal scrappers, the city just couldn’t keep up. 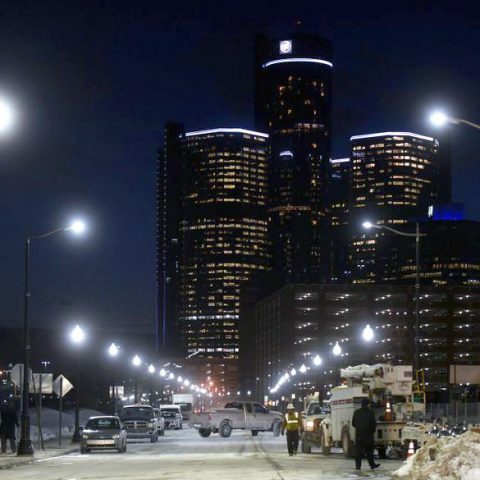 Then the State of Michigan created the Public Lighting Authority of Detroit (PLA) based on an idea fomented by former Mayor Dave Bing in 2012 to create an authority that was debt free at the time the city was going through bankruptcy. 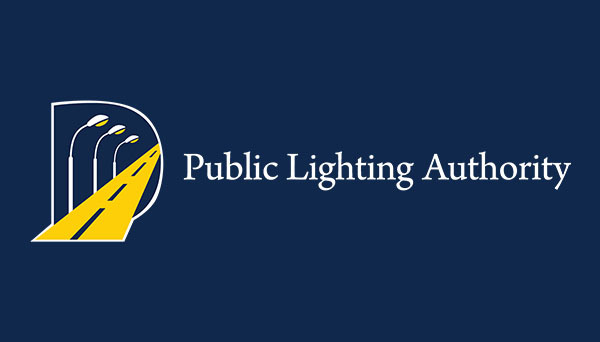 The PLA resolved to turn the lights back on all over the city through improvement, modernization, and maintenance. 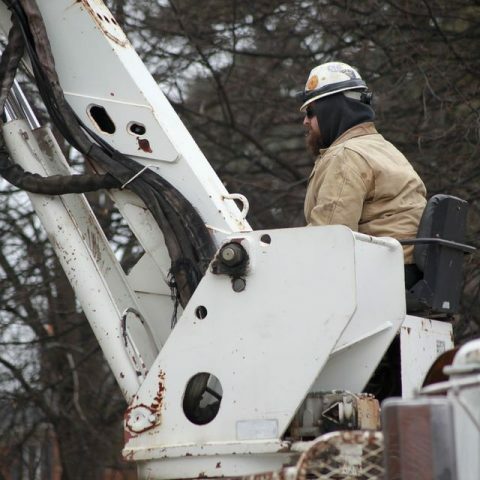 At the same time, they needed to optimize funding and act quickly. 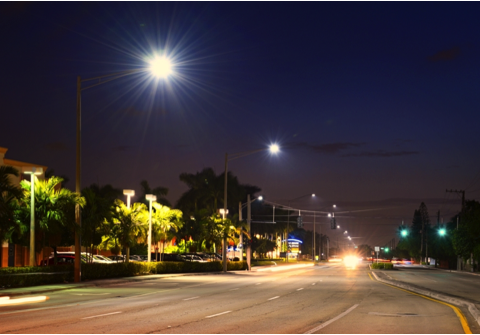 The PLA chose to modernize the city’s lighting by choosing high-efficiency LED lights. 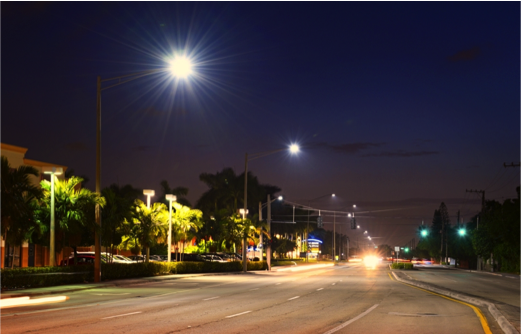 Not only are LEDs brighter than the old high-pressure sodium lamps, but they last 3-5 times longer, generate brighter, whiter light, and cost far less to operate. 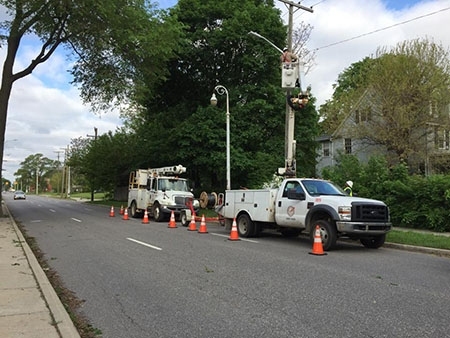 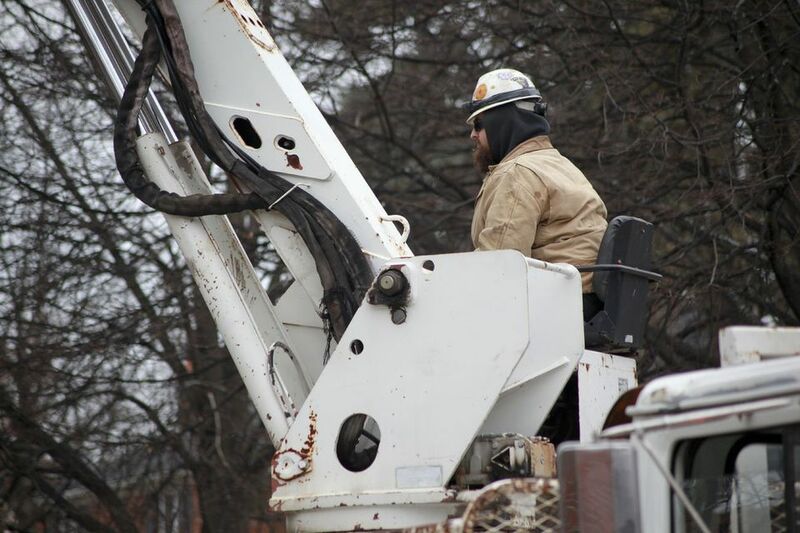 Motor City Electric Utilities (MCEU) was a key member of the team assembled to help the PLA achieve the goals of completely relighting all neighborhoods by the end of 2015, and all major thoroughfares by the end of 2016. 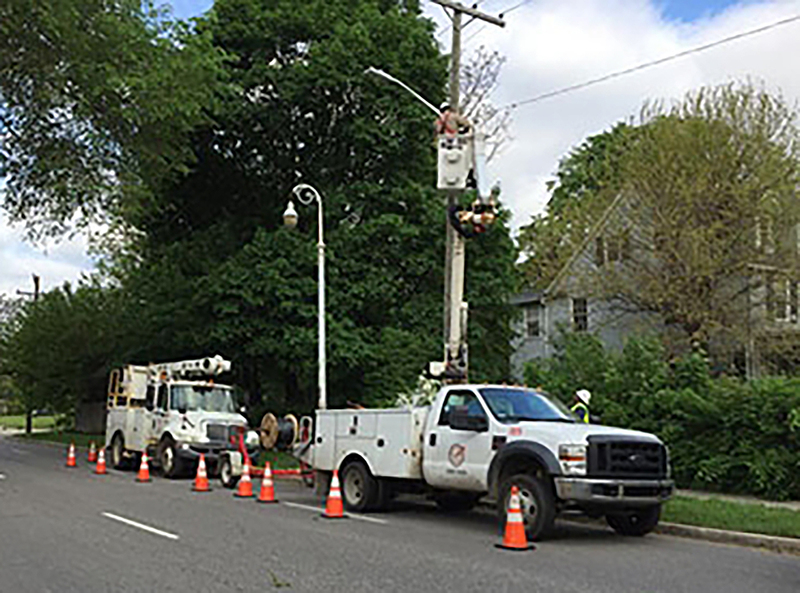 MCEU and two other contractors went ZIP code by ZIP code through city neighborhoods replacing the old streetlights and light poles. 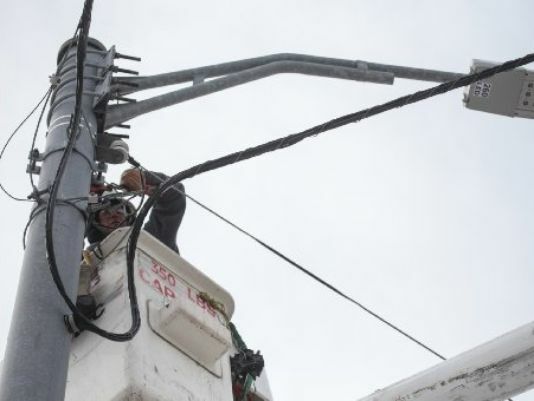 They also upgraded 85% to 90% of the lighting system’s wiring and circuitry infrastructure. 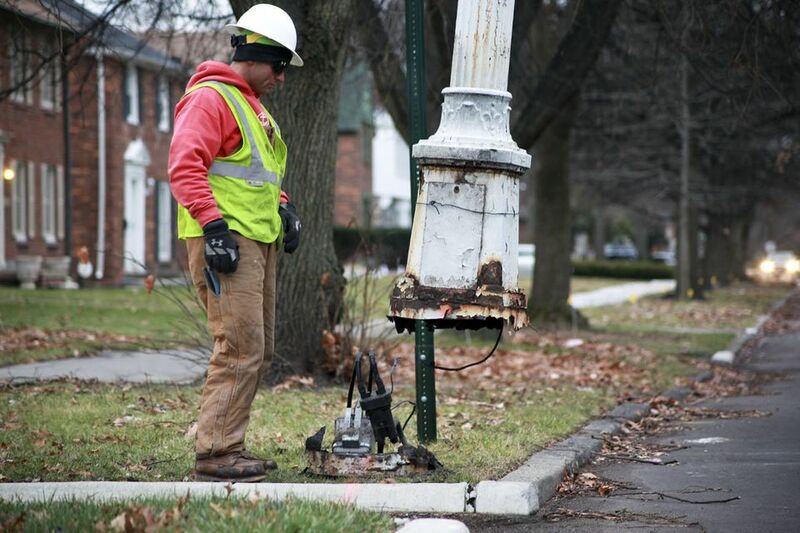 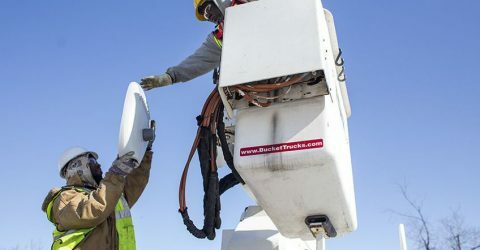 In many areas, the aged infrastructure was more than a half-century old and required a complete reconfiguration of the electrical system in order to be fed by the distribution grid provided by DTE Energy. 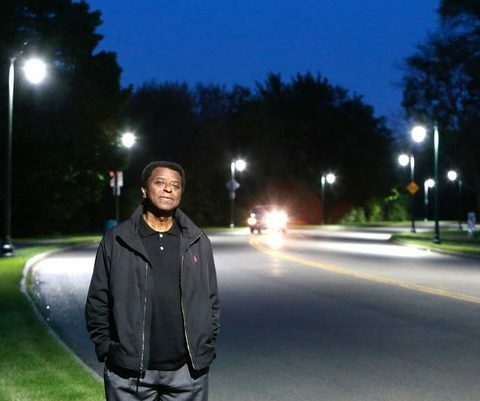 A total of 65,000 lights were installed. 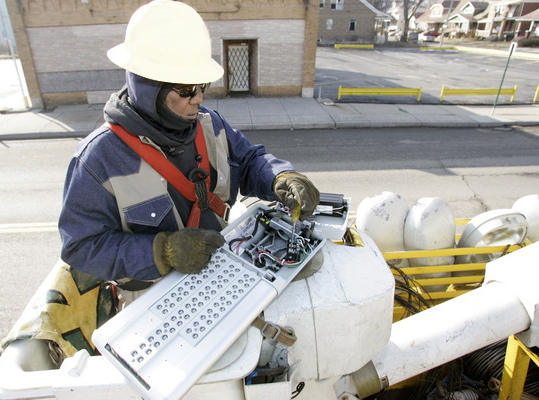 It was no small task—Detroit has roughly 30,750 street blocks covering 2,850 miles of road. 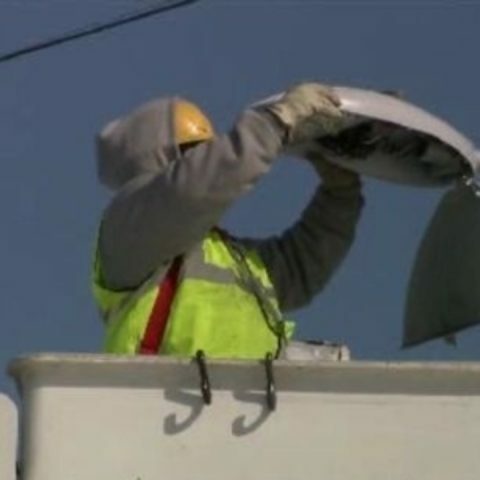 While the schedule called for crews to install 500 lights per week, they actually averaged 900 per week! 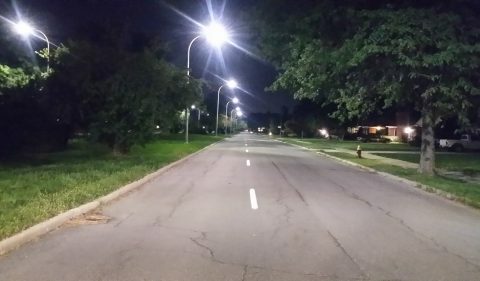 New street lights in neighborhoods are 150 watt equivalent LEDs, twice as bright as the 75 watt equivalent high pressure sodium lights that they replace. 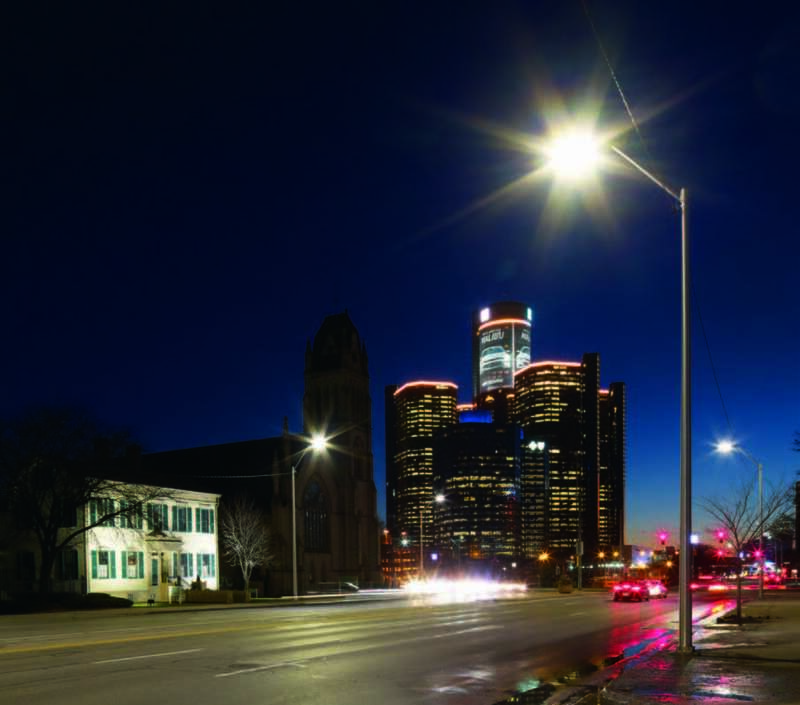 New lights on major thoroughfares such as Gratiot, Woodward, and Grand River are 400 watt equivalent, compared to the old 250 watt equivalent lights. 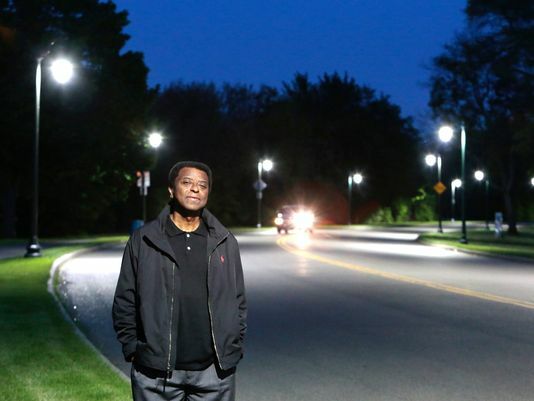 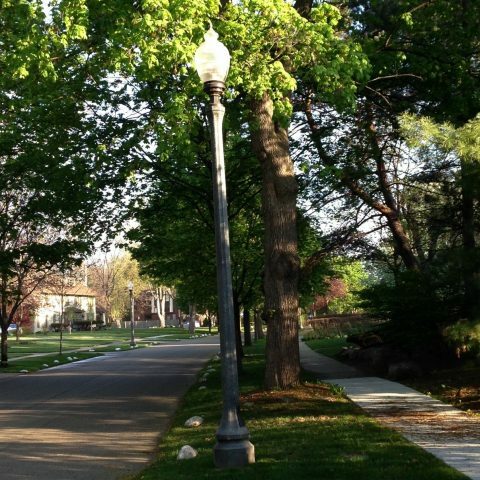 Residents in some of Detroit’s historic districts want to preserve the look of period styled street lights in their neighborhoods, raising funds to pay the difference in cost. 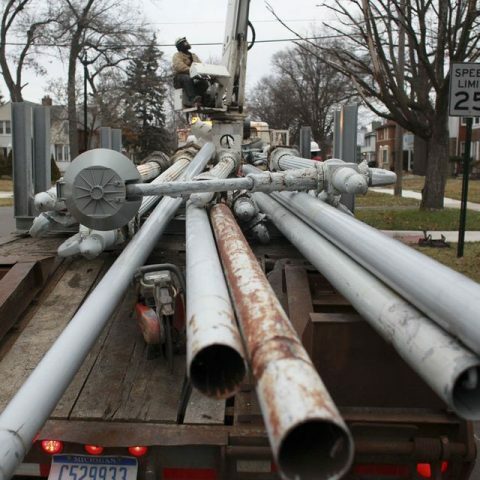 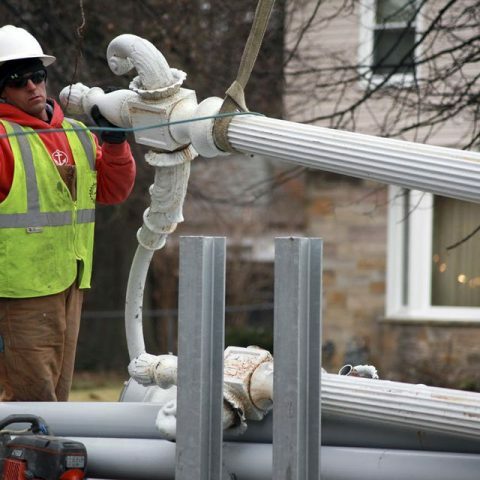 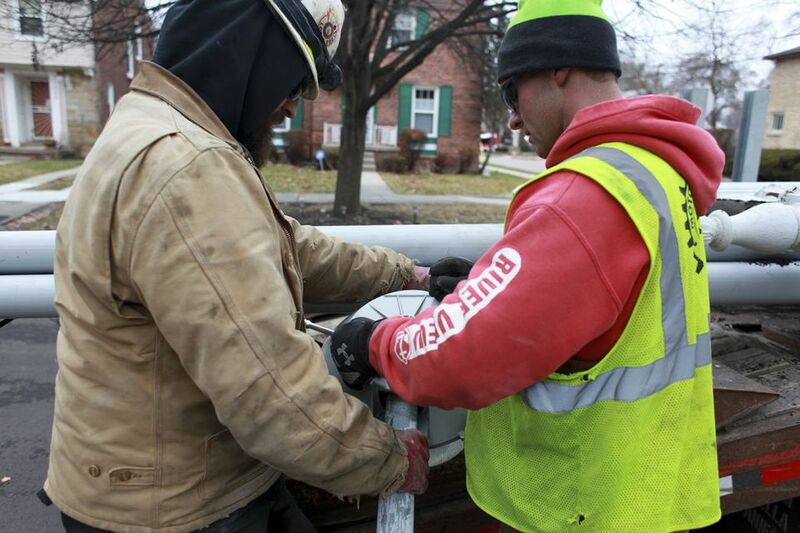 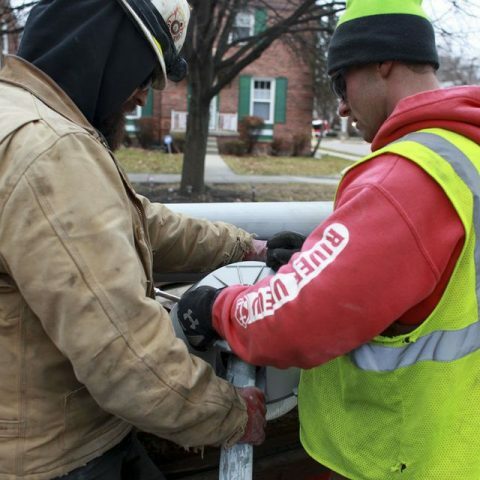 Several neighborhoods including Indian Village, Palmer Woods and Sherwood Forest paid extra to have decorative poles and light fixtures installed. 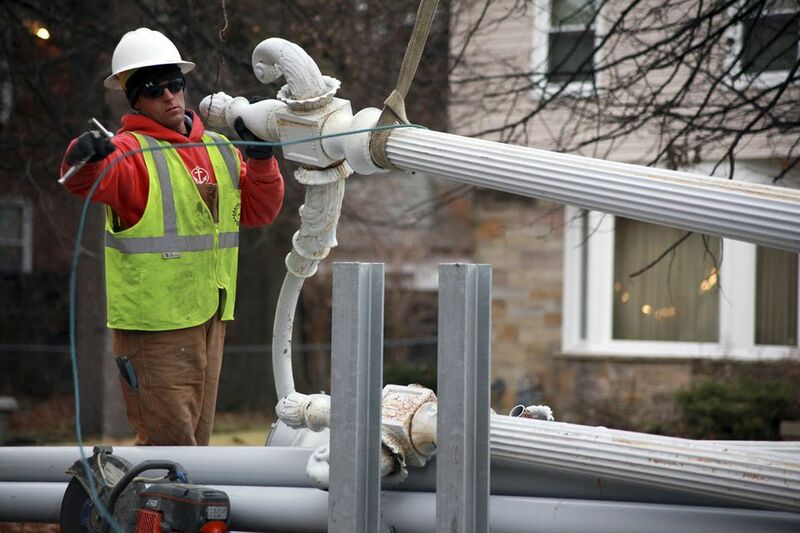 Some commercial districts, including parts of downtown, also received new, decorative street lights. 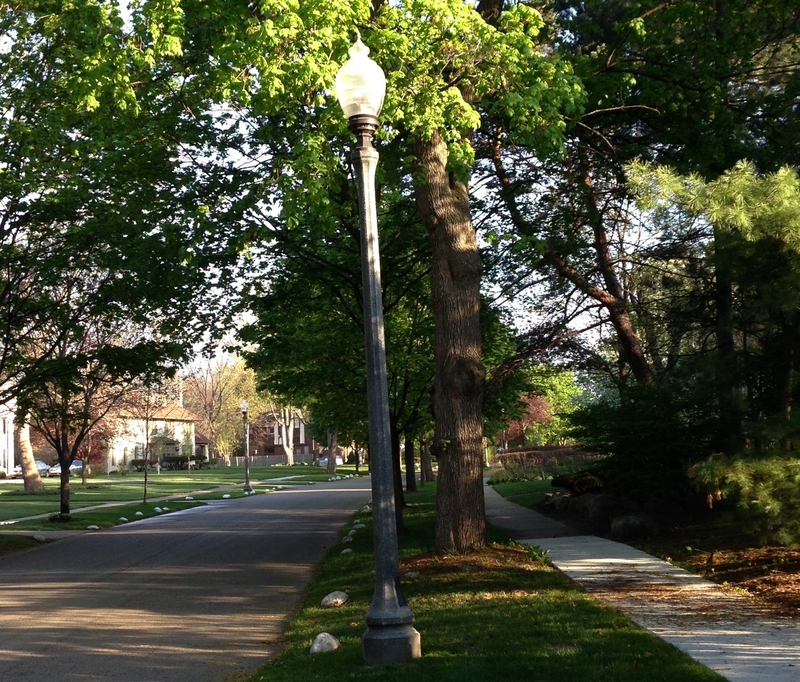 The Historic Indian Village Association talked lighting officials out of their plan to replace the neighborhood’s 1910s-era streetlight poles, which stand on tree lawns next to curbs. 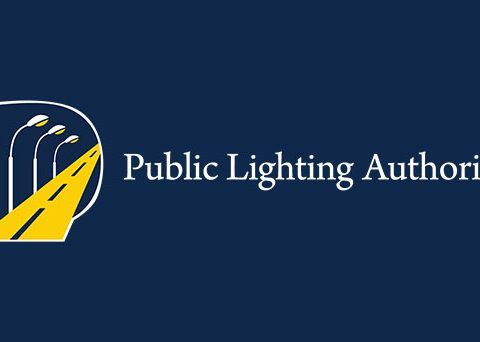 The association persuaded the PLA to restore the poles and install LED lights on them instead, then raised money for the extra cost. 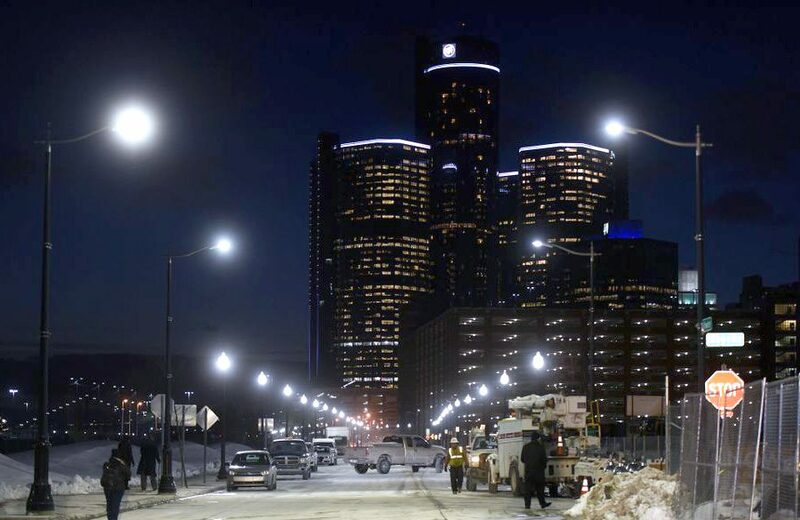 To protect the investment made in “relighting the city,” Detroit switched from copper to aluminum wiring in the new street lights, since aluminum has only a fraction of the value of copper on the scrap market making it much less attractive to potential thieves. 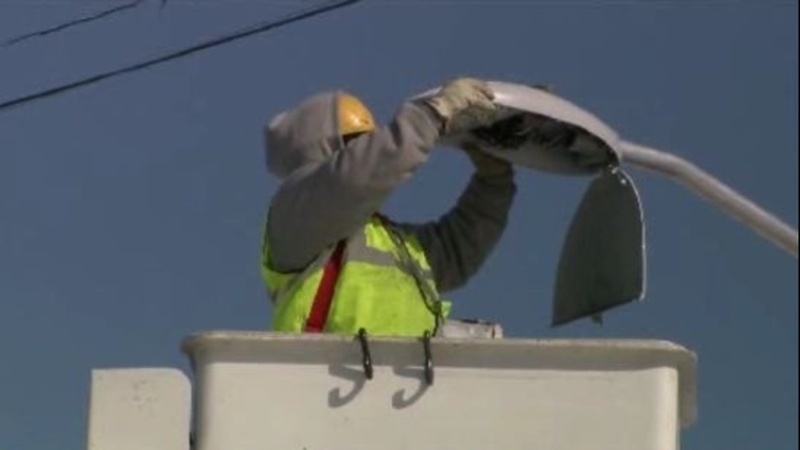 Additionally, the new lights use more overhead wiring so the copper that used to be found at their bases and pulled out and sold by thieves has been removed. 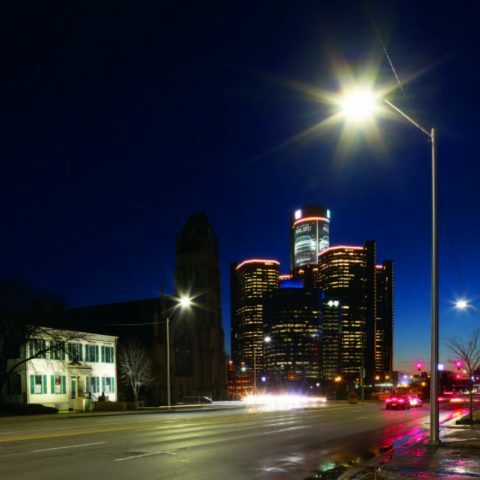 On December 15, 2016, the symbolic last new LED light was switched on and Detroit became the largest American city to have 100 percent LED public lighting. 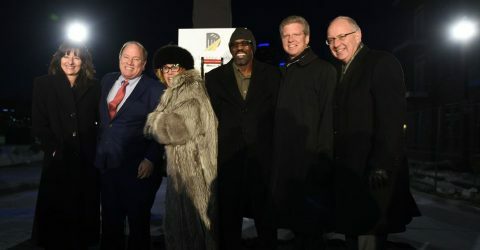 The $185-million project was completed one year ahead of the original schedule, and also a few million dollars under budget. 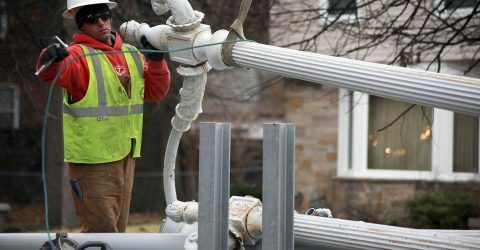 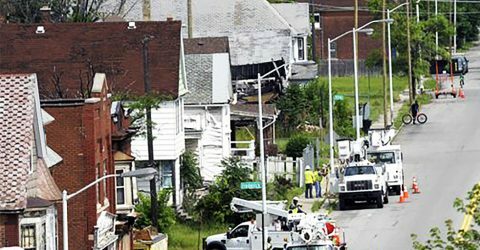 Detroit didn’t receive any federal money for the relighting effort, which was financed with a $185 million bond issue that will be repaid from a dedicated portion of the city’s utility user tax. 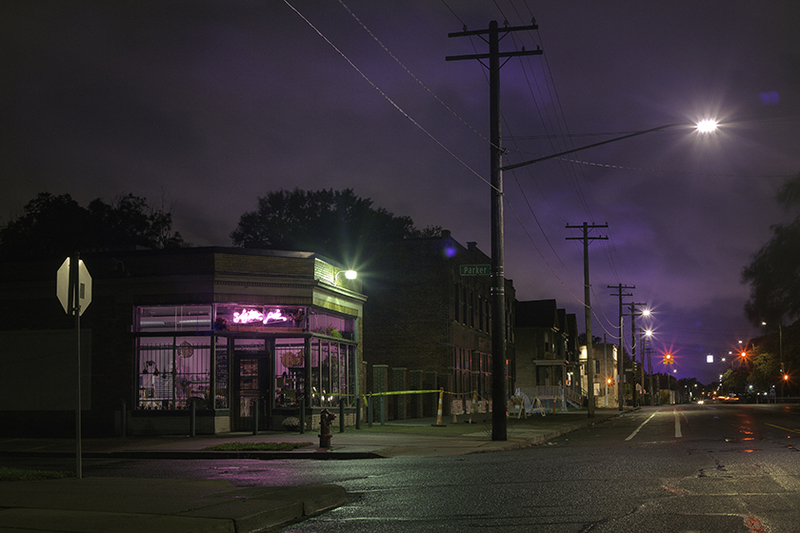 An added benefit to the new lighting is its effect on crime. Uniform street lighting assists police and residents in deterring crime. 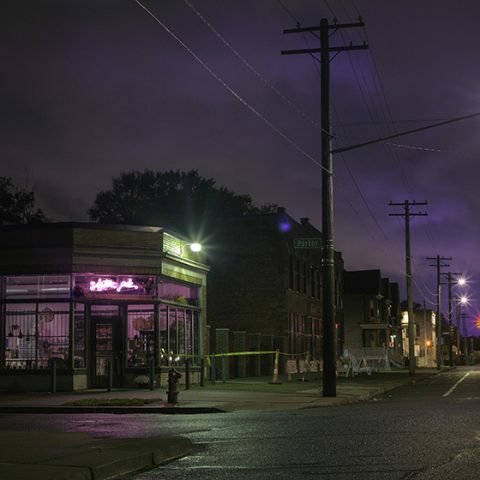 Burglaries, larcenies, vehicle theft, and other property offenses in Detroit are down 18 percent from the same time last year, according to the Detroit Police Department. 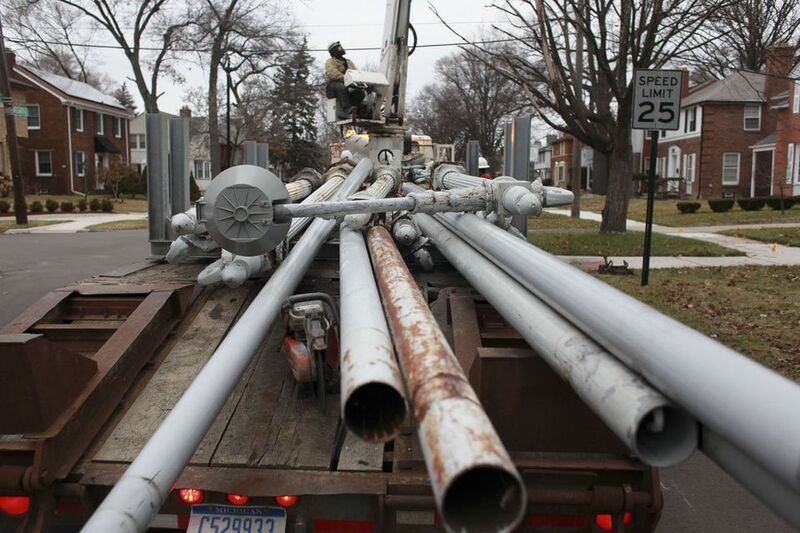 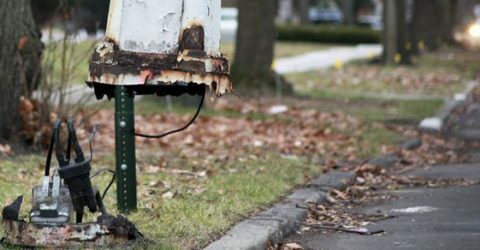 While the new ones are saving Detroit nearly $3 million in electric bills and cutting carbon emissions by more than 40,000 tons a year, one surprising cost has been the need to replace 50-60 light poles in the city each month that get hit by cars that miss a turn or leave the road for another reason. 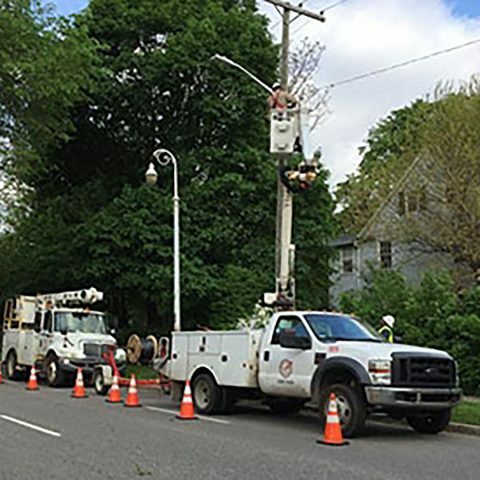 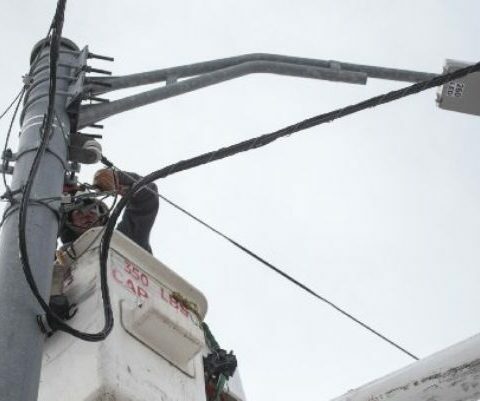 A maintenance program has been put in place that will address street light outages within three to five days of receiving a report of an outage. 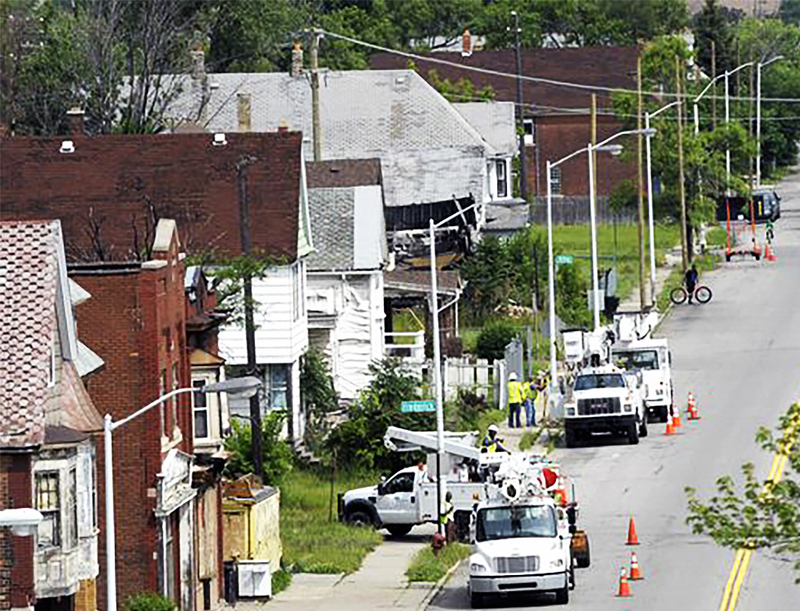 The PLA has a partnership with DTE Energy to offset staffing needs and aid in repairs of the system. 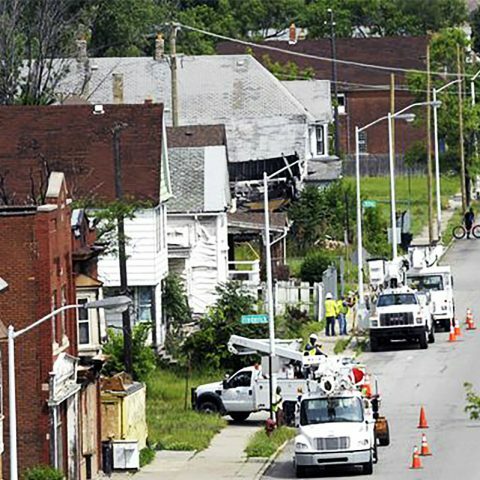 The city is slated to exit the electricity business by migrating customers to DTE over a seven-year period that began in fiscal year 2015. 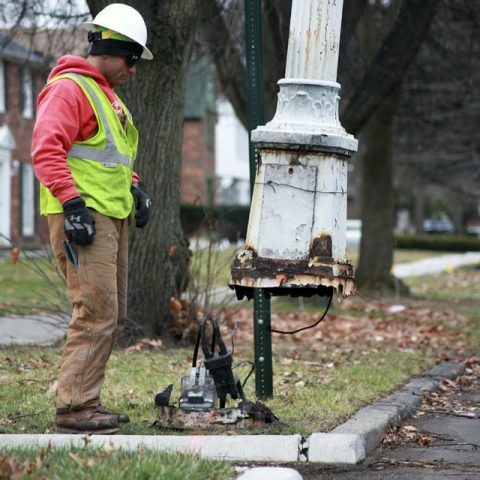 Detroit residents can contact the lighting authority to report a light out by calling 844-LIGHT313.